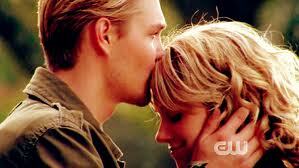 Lucas Scott proposed to Peyton Sawyer. She said she's not ready yet. Lucas got hurt, so both of them moved on without each other. When things didn't go well in Lucas' love life, he followed his heart and came back to Peyton to spend the rest of his life with. Engaged, Lucas found out about Peyton's past. An existing ex-boyfriend. "We were in love," she said. Lucas got into a few relationships, almost getting married to one. Peyton were in love with her ex back then, but still can't let go of Lucas because she knows that's where her heart belongs. When Lucas came into the picture, she immediately said yes to the proposal. the feeling where everything felt familiar watching One Tree Hill. i wanna go back to how we used to be. this Long-Distance-Relationship is killing us. haven't cried like this in a long time. dazing, wondering about everything in the world. when everything seemed so surreal. - LAST DAY OF SEMESTER 1! 2.35pm - Baby arrives in Canberra! 8.40pm - Arrive in Melbourne! 4.30pm - BACK in Malaysia! bite me. Watermark theme. Powered by Blogger.